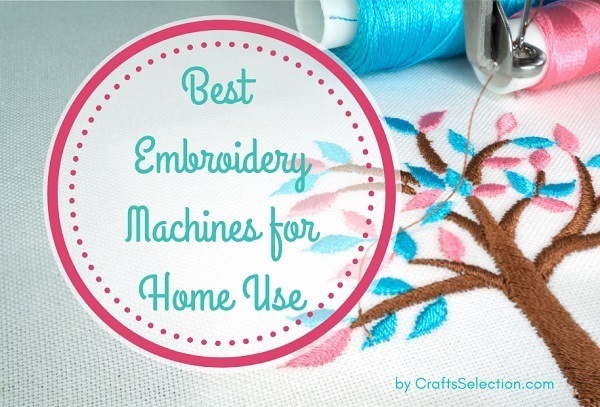 Are you looking for the best sewing threads to handle your sewing projects? Consider your days of searching over! Stay tuned as we bring you the best threads for sewing of different types and products, to help you achieve the much-anticipated success. 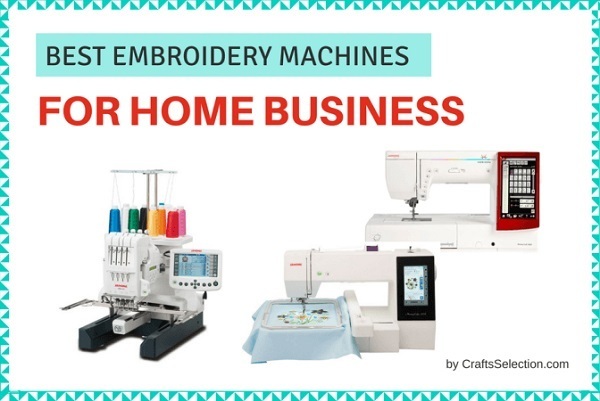 To help you make a quick selection for the right sewing threads you are looking for, here is the summary of top rated sewing threads (both hand and sewing machine thread) that come in different types and meet various sewing needs. 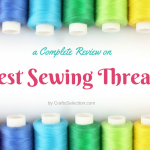 Click on the “Read My Review” links in the summary table to learn more about thread applications, quality of threads, thread size and quantity as well as helpful tips to make most out of your sewing threads. 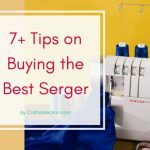 If you are a beginner and would like to have a good understanding of sewing threads before buying, here is the Essential guide to sewing threads that you should never miss. 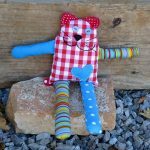 Enjoy reading and making more beautiful sewing stuff! As the name implies, all-purpose threads are simply multi-purpose threads that can handle almost all sewing projects. They are not as thin as embroidery thread or as thick as heavy duty thread. 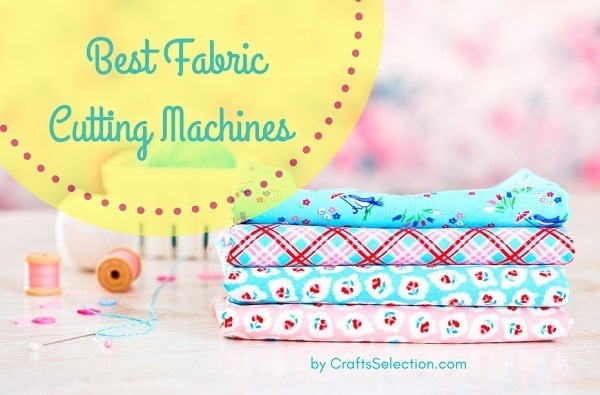 They perform well on almost all fabric and are good for sewing by hand or by machine. All purpose threads are made of cotton or polyester and are ideal for quilting, edge stitching, seaming… it handles it all. However, these threads are not ideal for use on fabrics that are very fine or very heavy, even for projects that will constantly withstand a high amount of heat or direct sunlight. This high-quality sewing thread is probably the best polyester sewing thread available on the market. This sewing thread set features advanced technology from Coats & Clarks for an enhanced sewing performance and comes in fifty 1-1/2 by 1-inch spools of 125-yards. 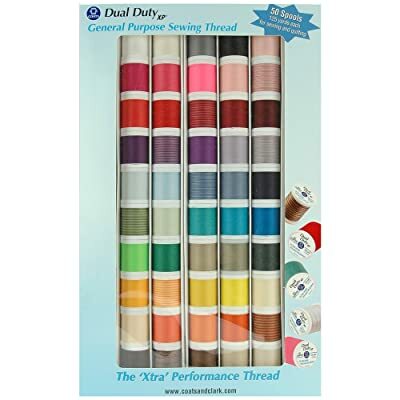 This high-quality sewing thread from Connecting Threads is made of 100% cotton material that has been well treated to for more luster and durability. This made it suitable for quilting, seaming, and topstitching on lightweight fabric. It also performs well on heavyweight fabric, it is smoother and longer (1200 yards), offering you an excellent sewability by hand and machine. It is probably the best cotton sewing thread you will find on the market. 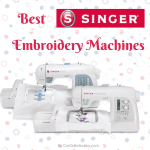 Looking for best sewing machine thread? The Sew Complete polyester thread should be your top choice. 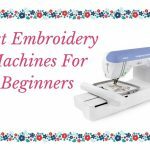 It is strong and smooth and specially designed for general sewing, crafting and decorative sewing manually or by machine. 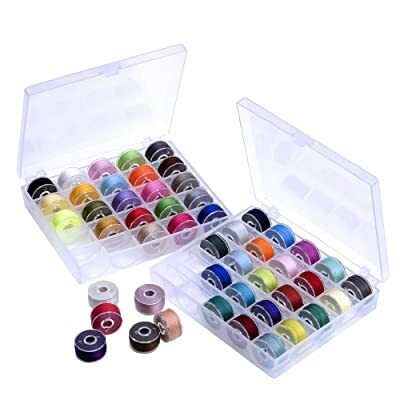 This assortment sewing thread set contains eight 300-yard spools of various color to complete your sewing project beautifully. Although this thread is seen as a cheap thread regarding its cost, its quality cannot be overlooked. 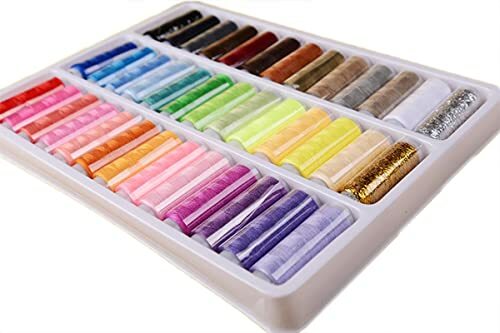 The LyonsBluesewing thread set comes with 39 assorted colors of 200 yards each (except for gold and silver color which are 100 yards each) to select from. They work perfect for almost all garment sewing projects and needlework but not suitable for use on the machine. Heavy duty threads are designed to withstand a higher amount of stress and tension. They are available in different weights and finishes to choose from, based on what you want to sew. Heavy duty threads are ideal for sewing medium to heavy-weight fabrics. They are the best thread for sewing canvas, camping gears, sports equipment and thick materials that can withstand a lot of wear and tear. 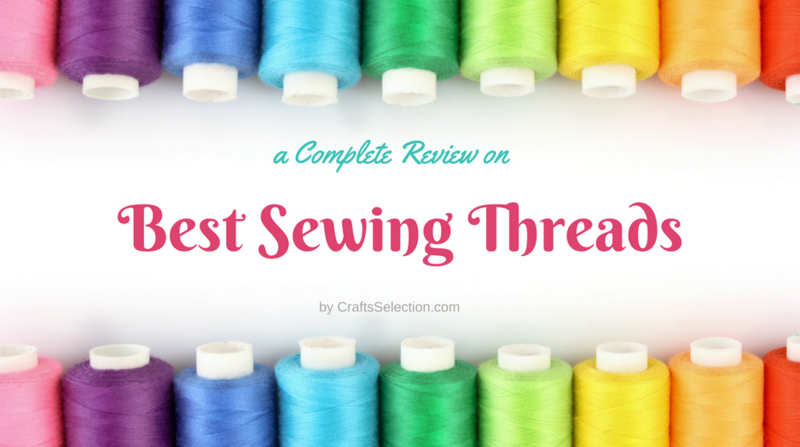 If you want a strong thread for your sewing projects, here are the best heavy duty threads to consider. 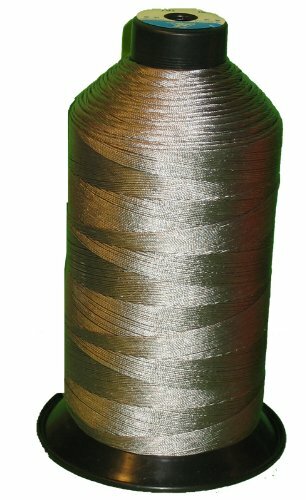 This thread is specially designed for sewing medium to heavy weight fabric. It features a unique polyester wrapped core with a dual-trap system for easy storage. It’s colorfastness, high tensile strength, and weather resistant properties make it the best thread for sewing canvas. Great price and offer a lot of thread (1500 yards) to work with. The Haobase bonded nylon sewing thread is appreciated for their flexibility, durability, and resistance to rot. This strong sewing thread is made of nylon and performs well even heavyweight fabric like leather, canvas, upholstery fabrics. It has a length of 1500 yards per spool and available in black and white color for your machine or hand sewing projects. Upholstery threads are sturdier and more durable than all purpose thread and are best used for upholstering furniture. They are usually made of polyester and nylon and are available in various weights. Nylon upholstery threads seem to be the best because of its strength and a higher degree of elasticity. However, matching the fabric fiber with your upholstery thread fiber is recommended. For instance, a nylon upholstery thread should be used for nylon upholstery fabric and an outdoor thread for outdoor fabric. Upholstery threads and heavy duty threads are sometimes used in place of each other but are not always the same. 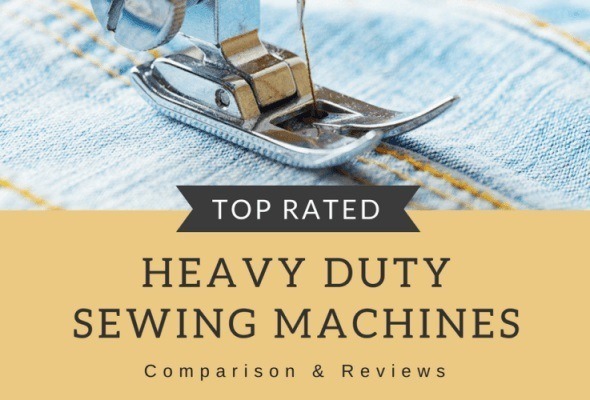 To help narrow down your search, the best upholstery and outdoor threads are reviewed below. 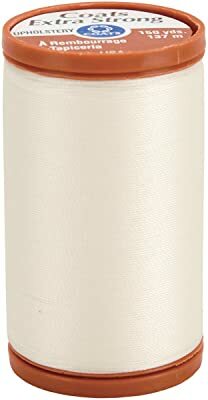 This is a high-quality upholstery thread, made of 100% nylon which makes it strong enough to withstand a lot of stress. 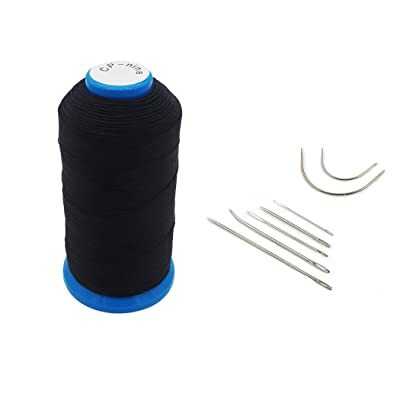 Its resistance to abrasion, weather, mildew, and UV rays does not only make it one of the strongest threads for sewing but also one of the best indoor and outdoor sewing threads. 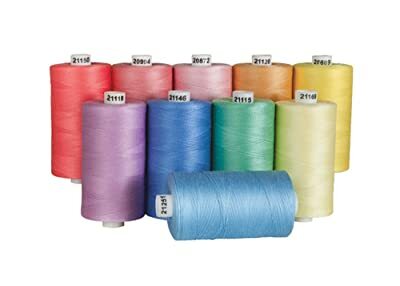 This is another high-quality nylon upholstery thread; it is sturdy, bonded for effective performance, boast a whopping length of 1500 yards and available in a variety of colors. It is great for upholstery, leather and also performs well as an outdoor sewing thread because of its strength, elasticity, and resistance to abrasion, weather, and mildew. 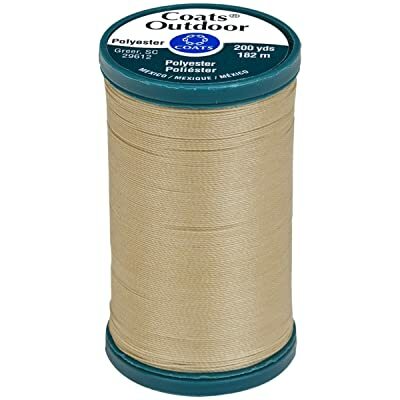 If you are looking for the best thread for outdoor use, this Coat outdoor sewing thread is for you. It is made of high-quality polyester fiber that ensures strength, durability and excellent sewability. It contains 200 yards threads and is available in a variety of colors to select from. Above are high-quality heavy duty threads you definitely won’t regret buying and using for your sewing project. However, they have to be properly used and maintained for them to deliver on their promise of quality. The following tips will help you make most out of these heavy duty threads. These sewing threads for jeans are a bit heavier (thicker) than all purpose threads and are purposely made for sewing jean and denim. 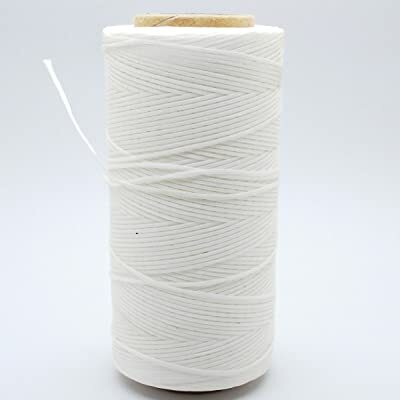 Most of these threads are produced as cotton wrapped polyester thread. Below are the top 3 best threads for sewing jeans. If all you want is the best thread for sewing denim, this would be your best bet. 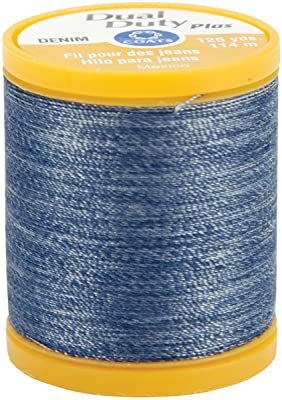 This Coats & Clark cotton wrapped polyester denim thread is highly durable and strong enough to complete your jean sewing project without a hitch by hand or machine. It has a length of 125 yards and comes with spool trap to hold the thread securely and prevent it from falling out. 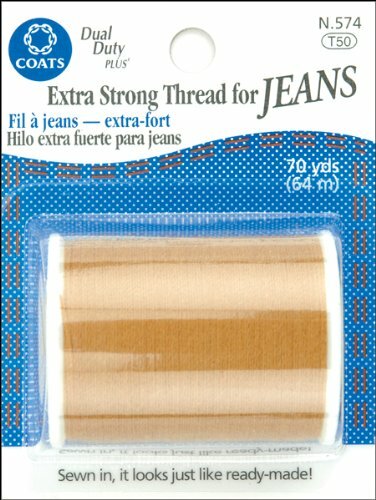 Another high-quality sewing thread for jeans from Coats & Clarks. It is sturdy and produces seems that looks just like ready-made. 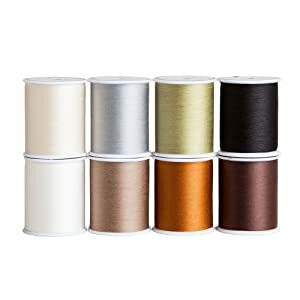 It comes in 70 yards of golden thread, and it is specially designed for strength, making it one of the best rated sewing threads on the market. This amazing product from Gutermann does not fail to deliver on its promise of quality. It comes in a variety of color to choose from, to complete your jean sewing or mending project. 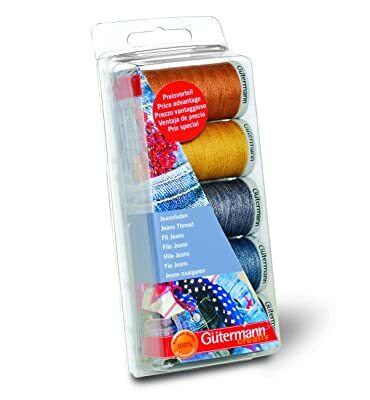 With its high durability and strength, Gutermann Extra Strong & Jeans Sewing Thread is highly recommended by both professionals and DIY sewers. Waxed bonded nylon threads are considered the best threads for sewing leathers because it is strong and creates low friction while sewing. Leather sewing threads are available in a variety of weights that match with different thickness of the leather. Maintain perfect stitches when sewing, care should also be taken to avoid too many perforations as it weakens the leather. Below are the best heavy duty threads for leather. This is a high-quality heavy duty thread for leather. It is made of nylon and coated with pure beeswax, which means a great deal of strength, flexibility, elasticity and higher performance on leather. It contained 25 yards spool of thread and available in various color but sold separately. This is another leather sewing thread that spews nothing but quality. This awesome KINGSO nylon thread is properly waxed to increase its strength and performance and works well for hand sewing applications. It has a length of 260 m, the thickness of 1 mm, and also available in other colors. For DIY enthusiasts like you, this leather sewing thread will be a helpful companion for craftwork. It is properly waxed to increase its strength and performance and works great not only on leather but other heavy duty material. It has a length of 260 m, the thickness of 1 mm, and available in more than 19 colors to choose. See also: How to Sew Thick Fabric? Elastic threads have a high level of stretch and rebound and are used for gathering and shirring fabrics. Their continuous elastic core does not only makes them the best thread for stretch fabric but also the best thread for sewing knits. Below are top 3 best elastic sewing threads. This is one of the best stretch thread for sewing proudly produce by Gutermann. It comes in a basic color black and white of 10 m long. Although the thread is thin and lightweight, it is strong enough for shirring, knits, doll making, and crafts without thread breaking. This elastic thread is made of 72% rubber and 28% polyester. It is very thin but not flimsy making it the right thread for knits and crochets for sweaters, socks, etc. It comes in the white color of 30-yard length. 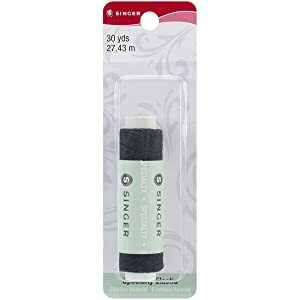 This Singer elastic thread is made of 58% rubber and 42% polyester. It is shrink resistant, and this makes it a nice thread for knits, and stretch fabric. It comes in the black and white color of 30-yard length. For machine usage, hand wind the thread on the bobbin and stitch on the right side of the fabric. Adjust your machine tension before sewing. This helps to reduce thread breakage. When ironing, be careful not to exceed 200 degrees Fahrenheit to avoid damaging the thread. Bobbin thread is a light, smooth, and high-tenacity threads used for sewing. The color range for this thread is limited and comes in cotton, polyester, and cotton-wrapped polyester. Prewound bobbins offer more convenience and hold more threads than the one you wind yourself. They are used for machine basting, machine embroidery, hemming, and sewing fine materials. 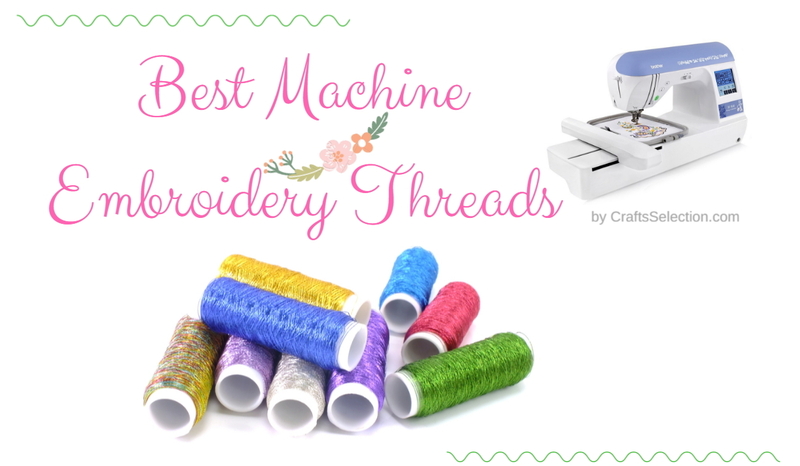 Below are the reviews for top 2 best bobbin threads. If you are looking for a high-quality bobbin thread, look no further than the Paxcoo 25 Pcs Bobbins and Sewing Thread. 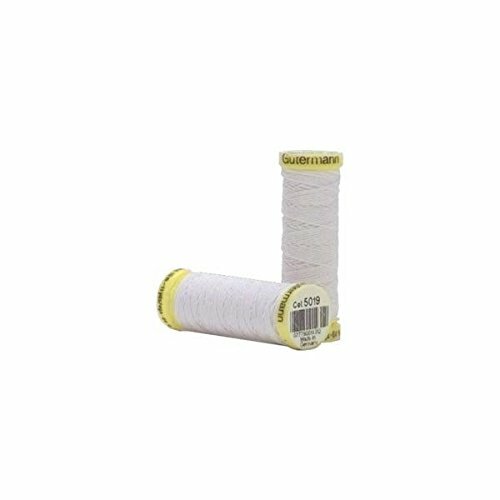 This polyester bobbin thread is perfect for sewing and embroidery and has a standard size that is made to fit nearly all home sewing machines. 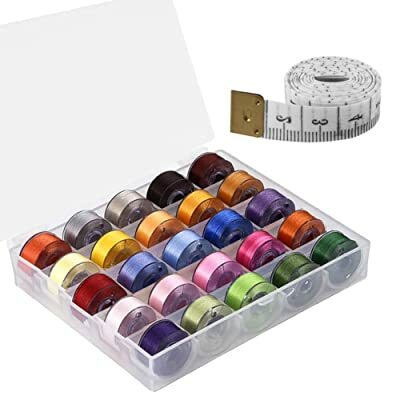 It comes with a 60 cm soft measuring tape and 25 assorted colors in a clear bobbin case, making it a great starter kit for beginners. 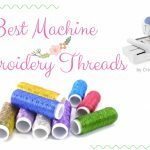 If you want the best sewing machine bobbin thread at the cheapest price, the Outus Prewound Thread Bobbins is your best bet. 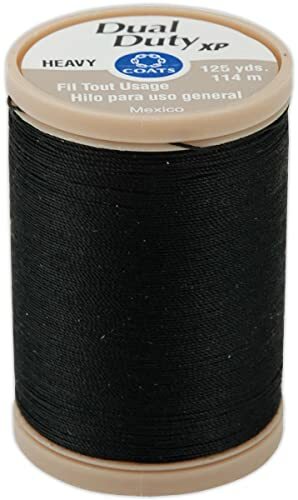 This polyester bobbin thread is perfect for embroidery and other DIY sewing projects and comes in a standard size that is made to fit nearly all sewing machines. It also features 50 pieces of assorted color bobbins in 2 separate clear bobbin cases. The following tips will help you make most out of your bobbin threads. See also: How to Choose Embroidery Thread? 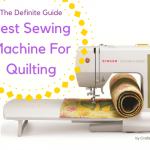 If you wish to take your sewing projects to greater heights, this guide, and sewing threads should be your best companion. Not only are the threads reviewed above high in quality, but also the best sewing threads for the money. Grab these threads, work your sewing project all the way up to success and come back with your testimonies!